This podcast is horrible. I have tried several times but I just can't get over how mean spirited they are about contestants. I understand we might not like the same ones but that doesn't mean you can just sit there and name call people and make fun of them. Also half the times they get contestants messed up, can't tell the different or report old inaccurate information. Just expected more from a podcast that claims to be the longest running reality podcast. Excellent. Great coverage of my fave reality shows. Great interviews. I don't mind the bits about their lives. It helps me remember that they are real people, not cheesy Hollywood guys. Also, who doesn't like a pricless gem of a story about a drunk preacher? Keep up the good work guys! No retiring until Jeff Probst does! We love Rob and Trevor. These guys are hilarious ... I'm in love with the fantastic shows the put out weekly!! Keep up the great work! Long time listener!! Great podcast on Reality TV. Keep up the good work Rob and Trevor!!!! I love Rob and Trevor. I find they're dynamic comical. I love that they use profanity when it is called for and I enjoy their discussion of the shows and theiry tangents. I tune in to this podcast "RFF Radio with Rob and Trevor" to hear Rob and Trevor, but in recent weeks Nico and Danny/Danni have been on WAY too much. Nico and Danny/Danni bring the level of the show down and Rob devolves with them. I couldn't even listen to the reality TV awards this year! I immediately delete any episode that Nico and/or Danny/Danni are on and hate that my download get's counted in their metrics. I wish they would put in the show description when it's not just Rob and Trevor so that I don't download and if Nico and Danny/Danni are going to become regulars please say so so I can unsubscribe. Favorite podcast for about 7 years. Great reality discussions and interviews! Great review of Survivor and Amazing Race. (Can't comment on Big Brother as that is one I don't watch). Love the strong opinions. So glad my husband introduced me to podcasts! This podcast holds a special place in my mileau of podcast experience in that it was the first podcast I listened to covering reality TV or anything else for that matter. It still remains a unique podcast for several reasons. The main reason is that both Rob and Trevor are not in the entertainment business. This illustrates the uniqueness of podcast ing at its best in that "regular people" are able to access this media and put on a show. Don't get me wrong, Rob and Trevor have some experience and skills that they bring to podcasting that make it work....Rob, if I have this right, is an IT guy at his local school district. This means that the podcast is technically sound and not lacking in quality. Trevor, I am not sure what he does for a living, but based on his discussions of what occurs on these CBS shows, must have some kind of job regarding analysis of some kind. I actually don't mind hearing about personal aspects of these guys lives at all. I am almost 60 years old and disagree with one comment here that these guys are too much like kids doing a podcast. People need to remember what they were like when they were this age.. Anyway, as far as the history of this podcast goes they have had some benchmark moments in exposing what actually goes on in BB. Also, they have had some incredible guest podcasts in the past. The one with Britney Haynes is an A+ in there archives. You are going to get a objective, critical perspecti ve of what is going on with reality TV with Rob's commentary. He does not aspire to have anything to do with being on reality TV personally. You will not find this with many other podcasts. Not that there is anything wrong with other podcast such as Cesternino's, BB Gossip, or The Rad Reality Show. Its just that this podcast stands apart because it is more critical, Rob is not connected toany players in the production of these shows and therefore gives you a more genuine perspective. Trevor always amazes me with the depth of his analysis of the personal intersaction of the players on these shows. The only negative comment I would add is their podcasts of late have been too short. If they are indeed getting tired of these shows, as many of us are, lets be realistic here, then I would appreciate Rob and Trevor moving on to cover other popular cultural media and events because I feel they definitely have something to contribute and would enyoy their perspective on a weekly podcast that lasts at least an hour. If you're interested in what it sounds like when two kids decide they want to have a podcast - and one frequently stops paying attention- then by all means tune in. The one time it was really good was when they had a guy substitute for Trevor - he was knowledgeable and smart and should have his own podcast. Otherwise they don't bring any special knowledge or interesting banter to the show. Love Rob and Trevor but Nico has to go. I'd rather have no show than a show with Nico. I really enjoy this podcast but wish it had continued on Wednesday instead of moving to Monday. By that time I have forgotten what happened on the episode of Survivor from last week. Other than that, love the podcast. Having a podcast that covers my two favorite shows (Big Brother and Amazing Race) is sweet!!! Great listen for insider info and a good laugh. Even better when they go on tangents about other shows, movies and why teachers in Nebraska have issue with computers. Lol Keep up the good work! Survivor, Amazing Race and Big Brother fans: this is your go to podcast! I've been listening to Rob & Trevor for years as they are the longest running Reality TV podcast. They mainly cover the CBS "Big 3" shows: Survivor, The Amazing Race, and Big Brother. They have great chemistry, are really entertaining hosts and I really enjoy when they do the in-depth anaylysis on the shows. So if you are a fan of these 3 show, hit the Subscribe free button and it will make these shows that much more enjoyable each week. This is my favorite podcast to listen to Survivor and Big Brother commentary. The show continually makes me laugh. These guys (Rob and Trevor) entertain and provide listeners good information. I've been listening for years. Trevor does have spotty Internet connections at times, but it's not the end of the world. Rob just goes on. Great work fellas. My only advice, Trevor may lead you astray with his movie selections. Keep up the great show guys. Keep coming back, but the profanity needs to STOP!!! Keep coming back around Big Brother time and keep hoping that they have improved their commentary, in particular, their language. Takes away from the show. This podcast covers all of my favorite reality shows and the content is hilarious. But I had to give it up today. One of the hosts has persistent connection problems and the dead air and filler during the show takes way too much time, something I have less of nowadays. This has been going on FOREVER and I just don't have the patience to listen anymore. There really is no excuse for it to be going this long, especially when given the option to hardline his connection and chooses just to keep dropping. Someone get T some internets!!! This use to be a good podcast. Now they just rush threw it they jump around in no order. Trevers internet keeps dropping out,it gets really annoying. I've listened for several years and I think that the podcast has become less focused and more scattershot. I know this has never been billed as a Family podcast but Rob's use of profanity is now gratuitous and simply over the top. What is most striking tho is the way he characterizes women on the shows he doesn't like. Crude, tasteless, and offensive. It's no surprise he's not the married one of the pair. If it weren't for their coverage of TAR, I'd move on. Too bad because it used to be the top Survivor podcast. One of top 2 Survivor podcasts out there! When some of the other Survivor podcasts out there go off topic, it turns into an annoyance and makes me want to stop listening. When Rob and Trevor (and Quana- who I hope to hear a lot more of) go off topic, I just hang on and enjoy the ride! Even when they talk about shows I don't watch, I listen because they're just fun to listen to! For Survivor info, it's a toss up between them and Rob has a podcast, maybe Rob C. Has a little edge there because he knows a the Survivors and can get slot of them to do podcasts with him and Nicole. For Big Brother, also a toss up, but the thing that gives these guys the edge is the Amazing Race, Rob C. Doesn't like to watch the race unless Former Survivors are on, Rob and Trevor have excellent coverage of the Race, and this season, actually played a part in the game by helping a team find their plane tickets! I love when they talk old tv shows like Quantum Leap, Saved by the bell, 90210, even tho I'm over some of those shows, they make me wanna watch again! I'd like to hear some talk about new shows like Psych(which I love), maybe Eureka, warehouse 13, I guess I'm a syfy and USA geek- lol! They could talk about any show and make it interesting and make me wanna watch. So, that to me is what makes them the number 1 podcast out there, they're more flexible than any of the other podcasts, I listen for reality tv shows, but don't mind at all when they talk about other shows as well! Keep Quana coming, the chemistry between the 3 of you is fantastic! These guys are a couple of goofs. This is an annoying, unfocused podcast. 15 minutes of a recent podcast was spent by these goofs pretending that it did not bother them that their lame show had not been nominated for a podcast award...geez. And that giggle that one of them has.....will I will just leave it at that. The only thing they love more than watching reality tv is discussing the shows in depth. Fun for fans! Good podcast for comedy and info but if your looking for good predictions go somewhere else. You can usually guarantee whatever these guys say the complete opposite will happen 90% of the time. But still worth a listen. I've been a listener for 3 years now and wouldn't miss an episode. Rob and Trevor have great insight into the gameplay on Big Brother, Survivor and The Amazing Race. They're smart, funny and a joy to listen to. I started listening during BB8 and am definitely a fan. I do try to listen during the non-BB part of the year but I don't watch TAR or Survivor. I highly recommend their Reality TV awards show each year even if Probst wins every year. I also recommend Rob's other podcast 'Two Cents Radio' which perhaps us aimed at a 20-something male audience. Love the fun you guys have recapping the shows! I find myself laughing along with you! Great coverage of Survivor, Amazing Race, and Big Brother. Rob and Trevor always have a blast. Finally, one of the most interactive podcasts out there as they record a show with their fans every Monday night. I have been listening to this podcast since the beginning. And I like it, and have tolerated the TERRIBLE AUDIO. YOU ARE A PODCAST and to be subjected to the drops, skips, and issue's of getting trever voice on the podcast is not entertainment. Post editing and talk with Leo or any other podcaster to learn how to do right. Pros: The guys do a great show. I enjoy listening to the show after watching my two favorite shows Amazing Race and Survivor and getting a unique perspective on things. I find myself thinking while watching the show "I can't wait to hear their take on this." Cons: Although funny at first, Trevor's lack of a consistent phone connection is a real annoyance. Also Rob's way off color comments at times reminds you that this is just two guys talking rather than a professional show which is a shame because everything else reminds you of a syndicated radio show. Great job guys!! At one time the rob and trevor were good, but they both have lives now and seem to be treating the show as a money machine- though I doubt the cash is that great. Mostly unprepared and mostly uninterested, they have succumbed to their previous high energy and have burned out. Sorry. I've just started listening and I'm already thinking - wow. I love how in depth they go into their podcast. The only problem I have is that Rob should interview EVERYONE voted out of shows, not just the ones that he likes or doesn't like. In the end though, I get the feeling that I'll be listening for quite a while! These guys are awesome. Finally a reality podcast that gets it!!!! If you like the CBS reality shows, you gotta check these guys out. Just dont ask them about Disneyland. Love you guys. Your friendly chemistry is enlightening, and I love your points of views on reality TV. Rob and Trevor are two of the funniest guys around. I can't go a week without this podcast. If your a fan of Big Brother, Survivor, The amazing race and other reality tv shows, this show is for you. Plus they have interviews with the reality tv stars. Lot's of fun. I love the Reality TV Podcast. 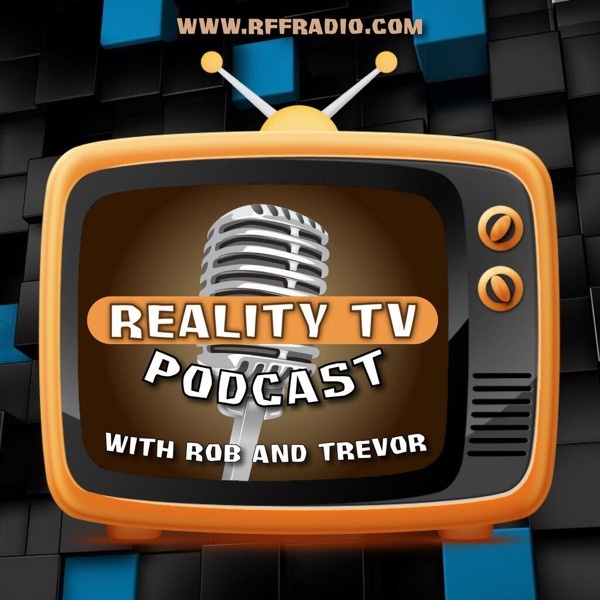 Rob and Trevor host a very entertaining look at the major reality shows on television. If you're a fan of reality TV, you have to try them out! Rff radio is the best podcast by far on all the internet. The insight from hosts Rob and Trevor are really funny and definately great. If you compared this to Gretchen Massey's House Calls, this beats it in a Landslide. The interviews great, the host funny, and the show is just very entertaining. A definate 5 star. Got to listen to these guys then go get the T-shirt. Not just informative but entertaining as well. Been listening for about 14 months and just got my RFF Radio T-shirt. The exclusive interviews are great. Even the reality show contestants are listening! Keep up the good work Rob and Trevor! Rob and Trevor make me laugh every week. The interviews with contestants are really great too! I love love this pod cast. The guest they get to interview r awsome, rob and trevor are soo funny. the guest from the reality shows r very candid with rob and they make u feel like u got to talk directly to the guest and they allways ask the best question. thank you rob and trevor, this is my fav and i look fw to down loading every week.. Solid weekly review of Survivor and The Amazing Race. They truly seem to enjoy themselves, and are enjoyable to listen to. I wish they did cover other reality shows more often tho.